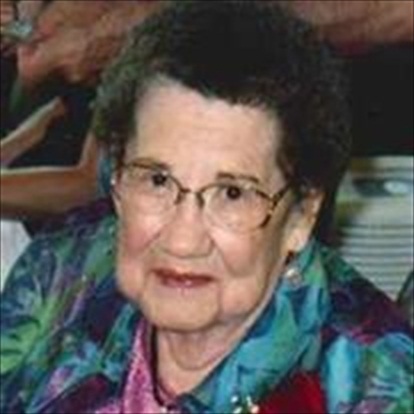 Raeburn L. (Ramthun) Kuschel age 93 of Zumbrota, formerly of Mazeppa and Plainview died on Tuesday, April 17, 2012 at the Zumbrota Health Services. The funeral service will be Saturday, April 21, 2012 at 1:00 PM at the Mahn Family Funeral Home – Larson Chapel with Pastor Sarah Nietz officiating. Burial will be in Mazeppa Cemetery. Visitation will be on Friday, April 20 from 4:00 – 7:00 PM and on Saturday one hour prior to the service at the funeral home. Raeburn Lucille Banick was born on August 11, 1918 in Mazeppa Township, Wabasha County, MN to Fred and Jessie (Spicer) Banick. She grew up in rural Mazeppa, attended Mazeppa Schools and graduated at age sixteen from Mazeppa High School in 1935. Raeburn worked as a nanny in Rochester for three years. On December 9, 1939 she married Robert Ramthun in Cresco, IA. They made their home in Byron until 1943 when they moved to Henderson, NV. Raeburn returned to Mazeppa while Robert served in the U.S. Army during WWII. After his discharge they remained in Mazeppa and Raeburn bartended for twenty five years at the Mazeppa Liquor Store, retiring in the mid-1980’s. Robert died on September 14, 1982. In 1987 she married Lawrence Kuschel and they lived in Plainview. Lawrence died in 1994 and in 1998 Raeburn moved to Zumbrota. Raeburn enjoyed playing cards with her sons-in-law and grandsons, bowling, gardening, canning, cooking, baking, singing,and dancing. Raeburn was a charter member and past President of the American Legion Post #588 Auxiliary in Mazeppa. She also served as past President of the Wabasha County Legion Auxiliaries and was a longtime member of St. John’s Lutheran Church in Mazeppa. Raeburn is survived by daughters, Janice (Keith) Jones of Zumbrota, Rita (Sam) Brown on Tuscon, AZ, Roberta (Larry) Heitman of Rochester and Paula (Gregory) Blakstad of Zumbrota; son, Keith Ramthun of Zumbrota; sixteen grandchildren; twenty six great-grandchildren; one great-great grandson; sisters, Evelyn Sobzcak of West Des Moines, IA and Bonnie Sharlow of Rochester and stepson, Don Kuschel of Plainview. Raeburn was preceded in death by her husbands, Robert Ramthun and Lawrence Kuschel; son, Kenneth Ramthun Sr.; sisters, Marilyn Curran and Merle Montrose and brother, Virgil Banick.